Why do we feel insecure in our relationships with other people? Because we intuitively know at a core level that we really cannot rely on others to live up to our expectations. This need not be interpreted as a negative condition. When you drop your false expectations, you truly lose your insecurity. We need not feel insecure in our relationships with other people because the quality of our lives reflects what WE do, not what others do. This may seem illogical, on the surface. If someone steps on my toes, hasn't that person done something to me? Hasn't that person brought me pain and unhappiness? You certainly can hold onto that perspective, but wasn't it you who placed your foot where it happened to be trampled upon? If you had been more alert, you might have averted the other's foot-fall. Even when avoiding a mishap seems humanly impossible, your perspective of what happens determines its value. As the ancient Roman Philosopher, Marcus Aurelius, wrote: "You have power over your mind, not outside events. Realize this and you'll find strength." 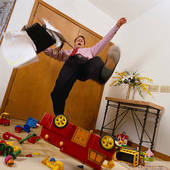 Every mishap offers a lesson in how to improve your own behavior for improved results. You certainly can blame others for not being watchful enough. But all that does is keep you feeling dependent and anxious about what people will do to you next. 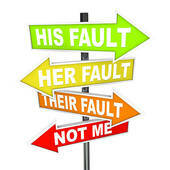 You don't have to hold onto blame, even if blame is your initial, automatic reaction. You don't have to blame yourself. You really do choose the perspective that you adopt. While you are busy blaming someone for a past event, you overlook your opportunities and dangers in the present, which sets you up for another disappointment. Don't worry about what another might do to you with his or her power. Remain aware of what you are doing to yourself and to others with your power. Directing destiny begins with intention. Know what you intend to bring about. Your intention then serves as your inner compass, guiding your choices in the now. We seem to feel that our lives would improve if others would only change. This attitude leads to the same old dissatisfaction and insecurity in relationships. To improve your life, see what you make of your life in the present moment. Do you hold onto resentment? Do you hold onto anxiety? Do you make it someone else's job to free you from unhappiness, irritation, loneliness, low self-worth? As you examine more closely what you are up to in the now, you discover an endless field of opportunity to improve the quality of your life in the now and to direct your life where you want it to go. When you are feeling insecure in a relationship it is a sign that you are giving another more power over you than that person really has. You cannot be taken advantage of without your cooperation. Resentment felt toward others is always a cover-up, a way of not facing the resentment we feel toward ourselves. Pay closer attention to the relationship between you and you. Notice how you treat yourself. Notice how your reactions to another's actions impact you, and take responsibility for your self-impact. The next time that you find yourself feeling insecure in a relationship, take your mind off of any thought about what that other person may be up to, has done, may do in the future. You give your power to the person you think about. Empower yourself by focusing your attention on what you are up to in the present moment and you will discover new and better ways to lead your life. You will replace feelings of insecurity in relationships with feelings of inner security, inner peace and authentic self-confidence. Reduce interpersonal strife and boost the morale of your workforce for more cohesive teams. Resolve conflicts between management and staff. Call 404-297-4043 or email for a motivating team building training for a more engaged and productive workforce.